Place all the ingredients in a food processor and blitz until smooth. Coat chicken and leave to marinade for at least 2 hours but preferably overnight. To make the salad mix the tomatoes, cucumber, shallots and fresh coconut together. In a pestle and mortar pound the red chilli with a pinch of salt. Mix in the lime juice and coconut milk. Toss into the salad and mix in the fresh coriander leaves. Heat a griddle on high until almost smoking. Spritz the chicken thighs with the oil then lay on the griddle and grill for 10 minutes, turning occasionally. Slice the plantain on the diagonal and griddle for 3 minutes turning halfway through. 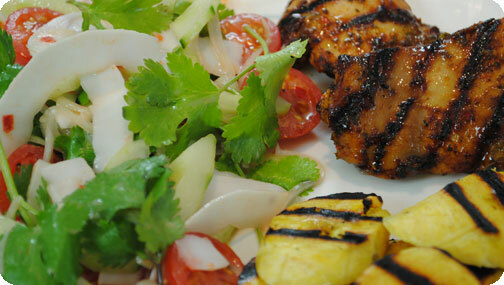 Serve the salad on a plate with two chicken thighs and some griddled plantain.